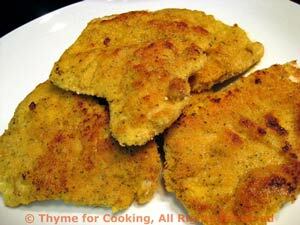 Turkey Cutlets with Mustard Crust, Thyme for Cooking gourmet menus. 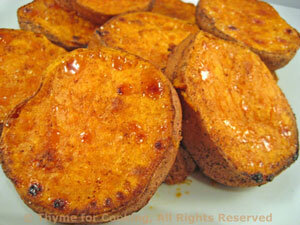 My love affair with sweet potatoes continues - here, cooked very simply. An easy dinner to finish the week. Another recipe whose origins are lost in the mists of time. It's delicious, easy and helps me get my weekly ration of spinach. Even non-spinach lovers are happy with this. With a bit of bread and a salad it can also make a light lunch. 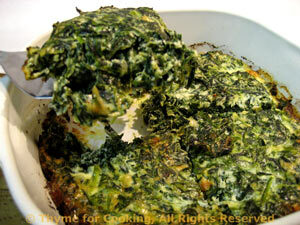 Thaw spinach (use microwave, hot water or saucepan) and thoroughly squeeze out excess moisture. In medium bowl beat eggs well. Add yogurt, Parmesan and nutmeg. Mix well. Lightly oil a small baking dish. (I use a 7 inch square glass baking dish) Pour in spinach and bake at 400F (200C) for 30 minutes or until set.